In Zagreb, on December 3rd, 2014 the 5th International Energy Conference was organized. The participants were government officials, a number of interested companies and experts from the country and abroad. brought together over 130 interested companies, sector experts and representatives of the media, and an important contribution to the work was made by many foreign participants and government officials of various institutions. the production of pellets and briquettes, or of building district heating systems. The emphasis in the program was on the experience of the use of biomass, as well as the promotion of pellets, the energy policy and the needs for optimal thermal energy from existing and future cogeneration. 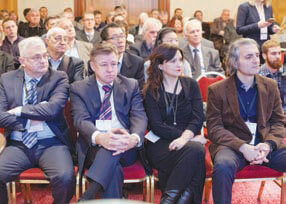 The latest technologies for processing of wood and forest biomass, boiler and cogeneration plants were presented. The great interest of foreign investors who plan their projects in the field of energy, renewable energy and biomass exactly in the area of SEE confirms thatthis is a very important and profitable area of investment. The participants agreed that the conference fully met the expectations regarding the level of published information, the quality of the presentation, as well as the interaction of participants, speakers and panellists. Wood and forest biomass are not used enough considering the quantity available, and the potential of agricultural biomass is taken into account only in theoretical discussions concerning an increase in the share of renewable energy. Fast-growing plants are insufficiently used for biomass and there are no projects to mobilize large areas of abandoned forest and agricultural land. Pellets are an increasingly important second generation energy source of the based on wood, but most of the production is exported, whereby the CO2 balance of customer countries is improved but not the CO2 balance in Croatia. There are notable government initiatives regarding renewable energy policy and energy efficiency and some local government units provide their own resources and motivate the population to use RES. The plan for increasing the use of biomass, and thus related activities with cogeneration plants, production of pellets and biomass, is not systematic and does not take into account the raw material, human and financial resources and energy needs and priorities. To continue with the implementation of educational and marketing campaigns for pellets among professional users and the wider population and to involve all stakeholders in the financing of the campaign. To ensure the use of all existing biomass in natural forests and to make sure that all non-productive forest and agricultural land is set up for energy plantations. To use products and residues from agriculture, horticulture, etc. as energy production resources. To create a broader promotional campaign regarding district heating, but also regarding mini heating plants for schools, kindergartens and other public facilities. To take a more active role in the promotion of fuel based on wood, especially wood pellets, through a system of public procurement, where stoves burning fossil fuels should be replaced by biomass stoves. This will make a major contribution to the implementation of the new European energy policy, which looked for an additional increase of RES energy by 2030. To increase self-employment in rural areas through EU funds for the collection and processing of forest biomass. To provide sufficient quantities of raw materials and 14-year contracts for wood processing companies that start cogeneration plants and pellet production. Update the OIEKPP registry and publish a list of all contracts for wood raw material intended to be used for energy production.